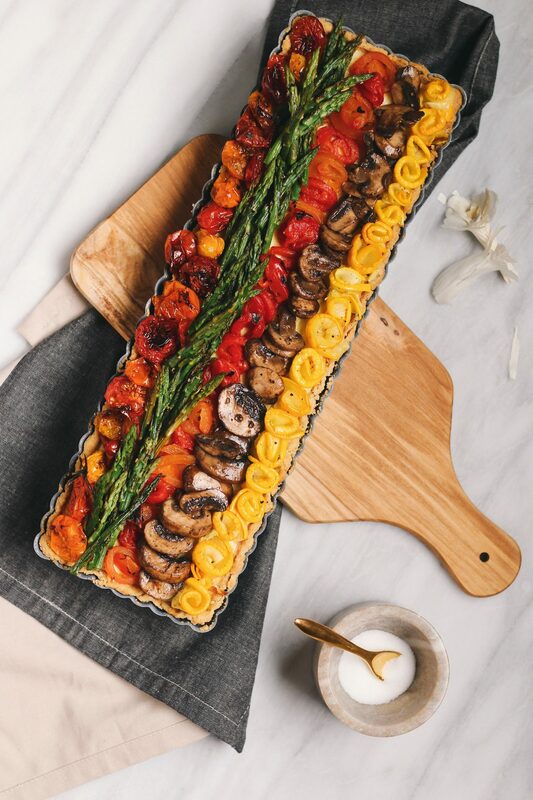 How pretty is this vegetable tart? All of your messages put a smile on my face. 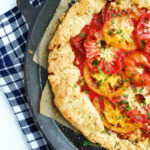 I love a good savory tart, and I was very happy to see that others do, too! 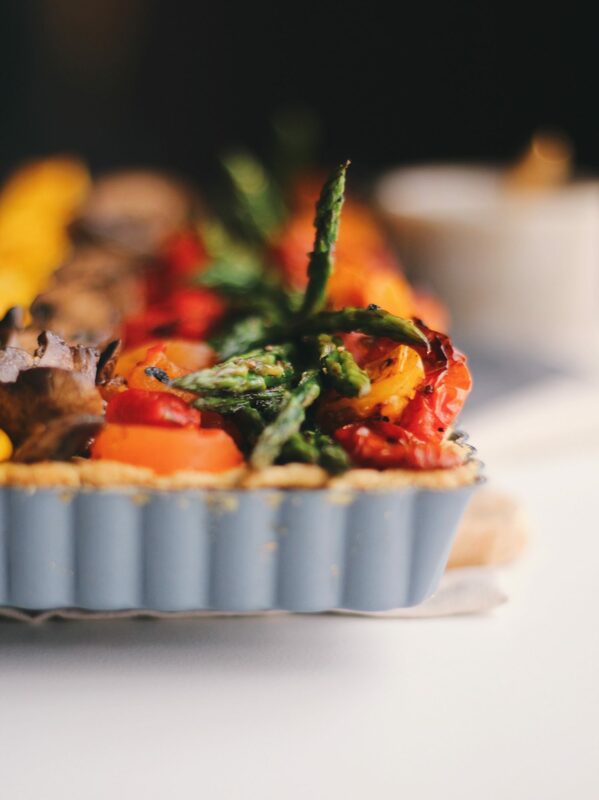 This delicious vegetable tart is stunning and not as difficult as you would think. The crust for this vegetable tart is an olive oil dough that’s speckled with herbs and black pepper. One of my favorite parts about this tart dough is that you do not have to roll it. This dough is pressed into your tart pan—no rolling pin required! The olive oil gives a wonderful rich, fruity, and savory profile to this tart dough. 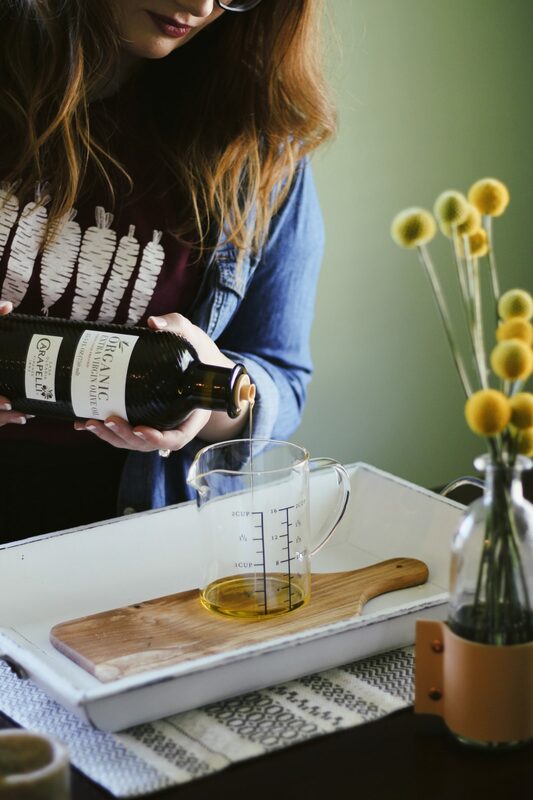 It’s important to use a high-quality olive oil here. I used Carapelli Organic Extra Virgin Olive Oil to make this vegetable tart. 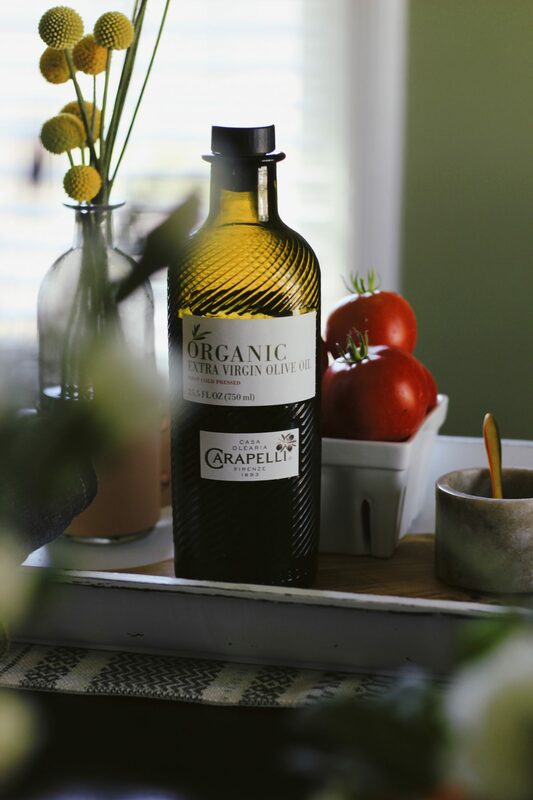 The flavor of this organic olive oil is soft, balanced, and pairs perfectly with both the flaky dough and the roasted vegetables. 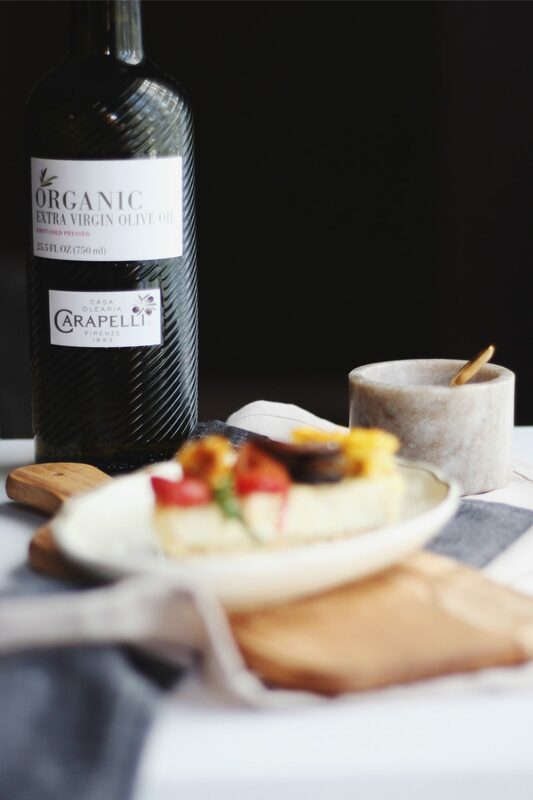 I use Carapelli in my kitchen because it’s delicious and skillfully crafted from quality, delicate olives with respect for nature. The filling for this Ricotta Vegetable Tart is—you guessed it! —ricotta. No special equipment needed for the filling, either. The ricotta simply gets mixed with eggs, milk, Parmesan, sea salt, black pepper, sautéed leek, garlic, and fresh rosemary. 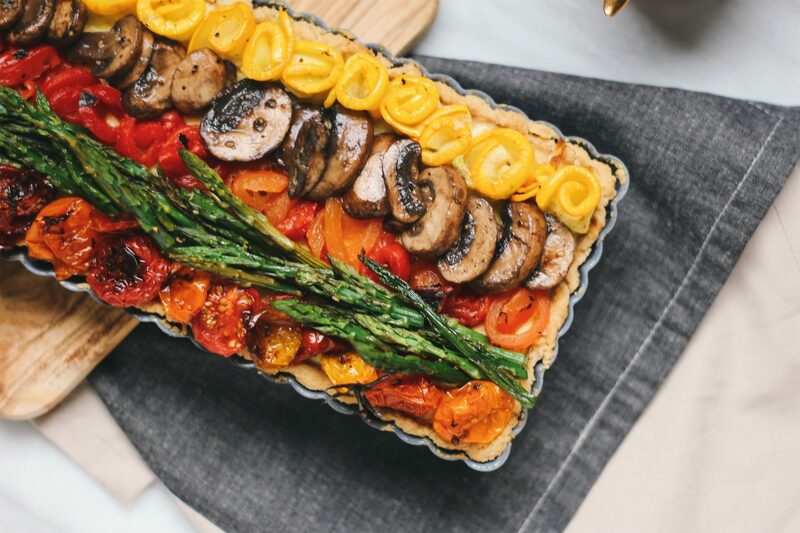 Baked until golden brown and topped with roasted vegetables, the beauty of this vegetable tart is that you can use any vegetables you like. 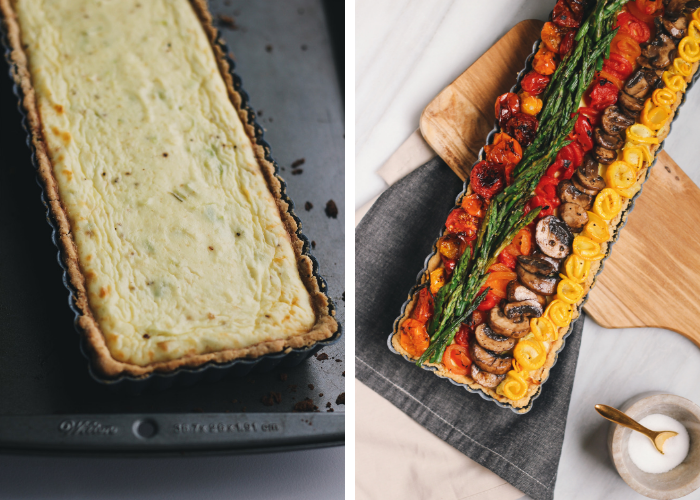 What vegetables work well in a quiche or vegetable tart? Most relatively quick-cooking vegetables work well in quiche or savory tarts. However, most require you to cook vegetables beforehand. I like to roast my vegetables, which brings out incredible flavor and makes a world of difference. 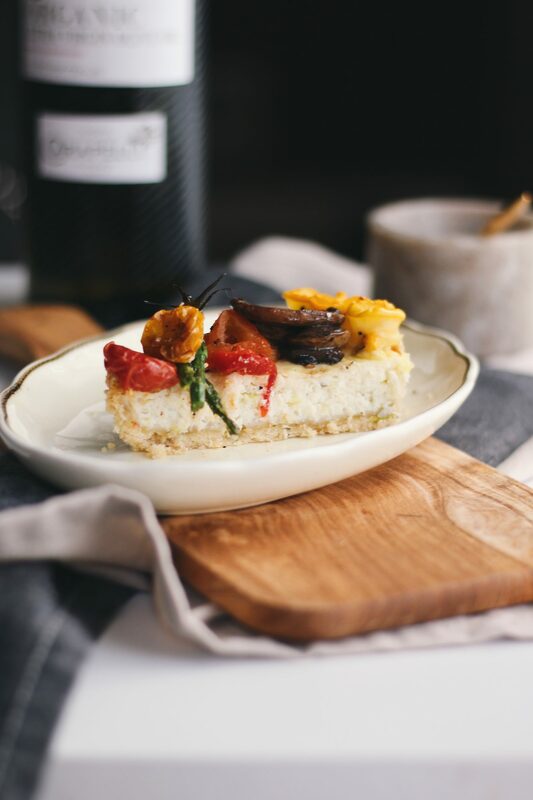 What should I serve with this Ricotta Vegetable Tart? 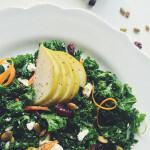 I recommend a nice side salad, like this Italian Chopped Kale Salad with Lemon Oregano Vinaigrette. Other ideas are some warm crusty bread and butter, French Onion Soup, or a comforting soup like Hazelnut Parsnip Soup or Chicken Orzo. 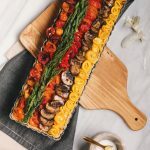 I hope that you make and enjoy this colorful Ricotta Vegetable Tart! 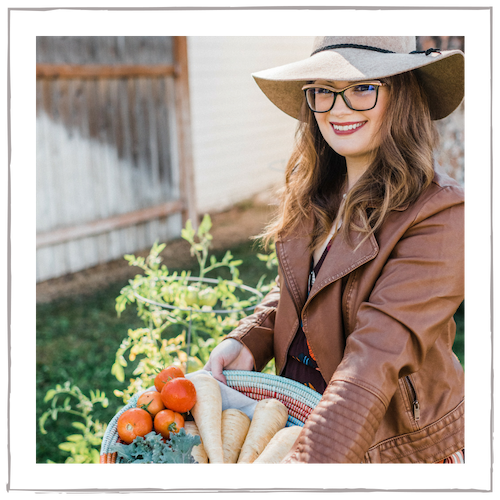 Be sure to check out Carapelli for the organic olive oil I used in this recipe, and even more delicious inspiration! 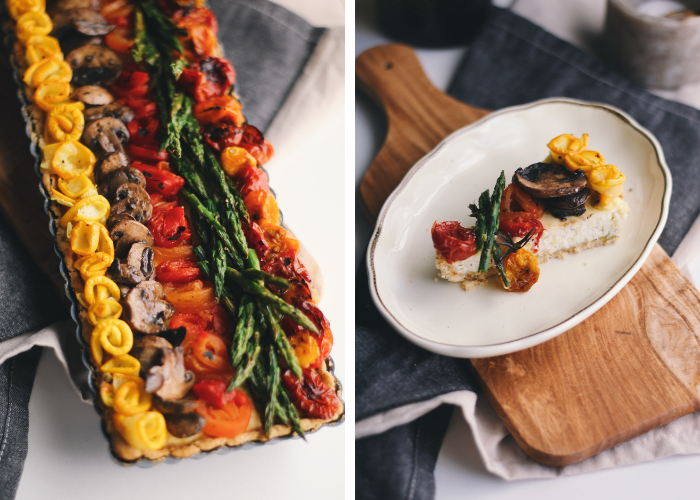 This Ricotta Vegetable Tart is made with a savory herb and olive oil crust and topped with colorful roasted vegetables. In a large bowl, whisk together the flour, salt, pepper, and herbs. Whisk the milk (or cold water, if using instead) with the olive oil and pour in the center of your dry ingredients. Using a fork, mix the flour into the olive oil mixture until wet. Knead the dough in the bowl until it just comes together. Spray your tart pan with baking spray (either a 14″ rectangular pan like I used or a 9/10″ circle pan). Press the dough into your tart pan, covering all of it and ensuring there’s no patches or gaps. Piece and pinch the dough to cover the sides. Blind bake the tart at 400 degrees F for 15-20 minutes until just golden. Prepare the filling. Heat the olive oil in a saute pan and cook the leek and garlic until translucent. Let cool. In a large bowl, whisk the ricotta with the eggs. Whisk in the milk, Parmesan, and rosemary. Season the mixture with salt and pepper. Fold in the leek/garlic mixture. Turn the oven down to 350 degrees F. Pour the filling into the baked tart shell and bake for 20-25 minutes, until the crust is deep golden brown and the filling is set in the center. The filling should be slightly firm when touched and should not jiggle. Let the tart cool until warm and top with the warm roasted vegetables (see notes). Enjoy! 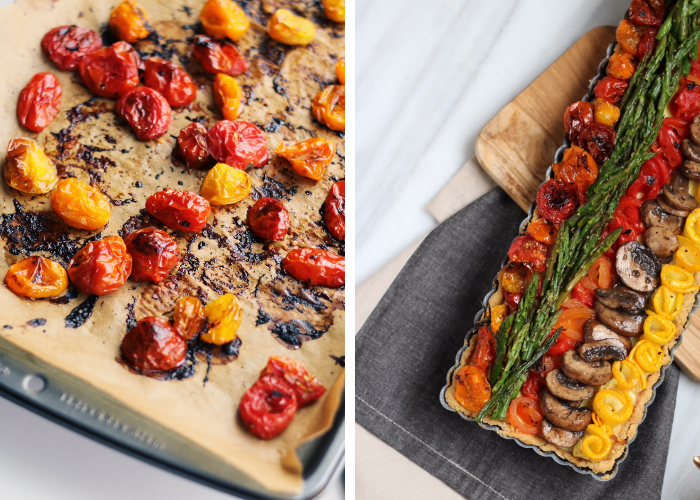 You can use any roasted vegetables to top this tart that you’d like! I used roasted tomatoes, squash, mushrooms, peppers, and asparagus. 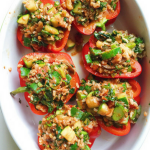 You could even use just one vegetable if you’d like (like roasted tomato). 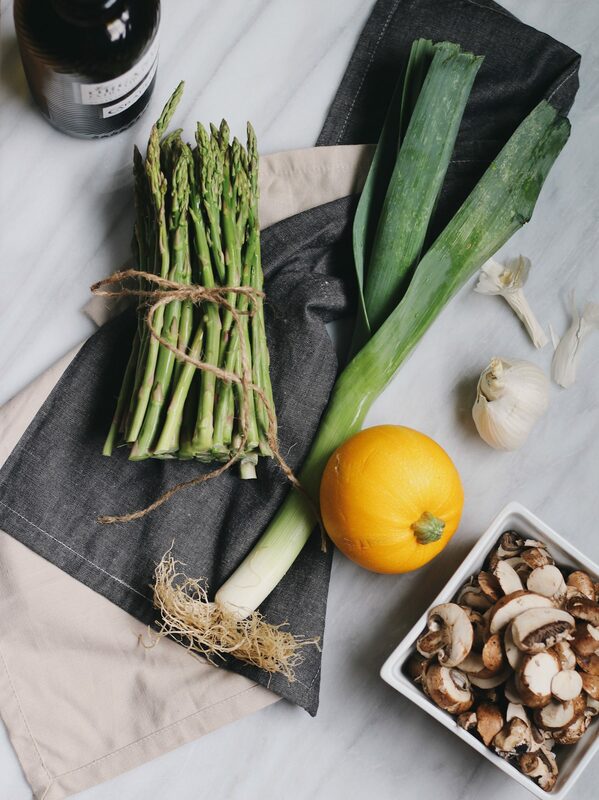 For times, tips, and temperatures for roasting veggies, see here. The pictures look too tempting. I like that the dish is so healthy and fresh. I would have never thought to make this but it looks so good! Ricotta and vegetables ? Im in! I know your instagram but having several pics here is such a pleasure! The colours of the vegetables in this dish are just fabulous. I don’t often cook with ricotta but might just give this a go. this looks amazing! i want to make this soon and try it! Fantastic. I’ve made quiche but I always thought that tarts had to be sweet and dessert. 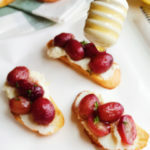 I love Ricotta and this looks fab! 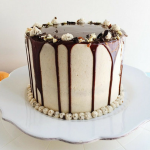 Ohhhh Tiffany, this looks divine! Imagine pulling up to the table with this beauty when hosting a dinner party! 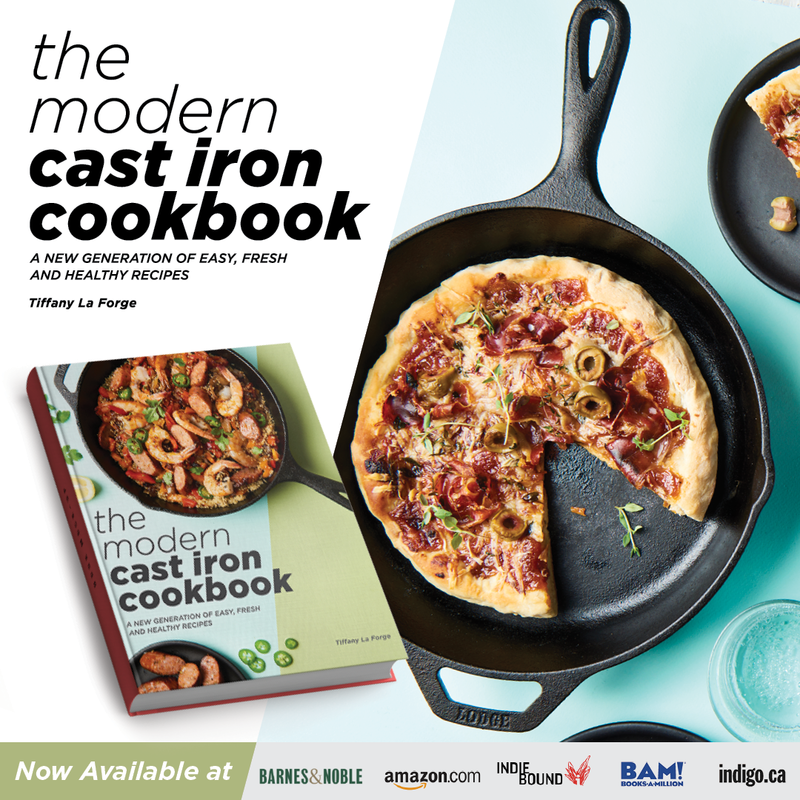 Definitely adding this to my recipe list! Now this looks like a wonderful dinner idea. I can’t wait to try this. What a beautiful tart! This is just the kind of meal that my family would love – delicious pastry, and tasty ricotta filling all topped with gorgeous vegetables. Perfect! Wow! This looks yummy and very healthy too. You sure bring a very good twist on this recipe, will definitely make this at home. Love this recipe and this is something I’m gonna try this weekend! This is a perfect and a delicious stuff this coming thanks giving.. I would love to make with my own.. I pinned it. I am definitely going to make this one day soon. It look absolutely delicious. Thank you, Stacey! I hope you love it. Oh yum, that looks so tasty! I have bookmarked this post for future reference. I will definitely be trying it out soon. Thanks for sharing! omg i kept on going back to the pictures over and over again, they look so delicious! I am definitely giving this recipe a shot. Thank you so much. 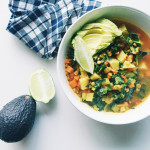 I adore your use of colours in this recipe! 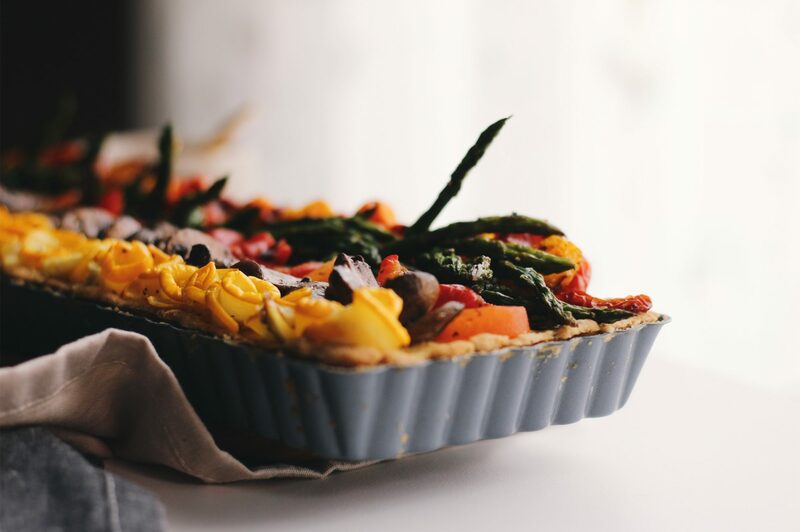 I think ricotta and vegetables go so perfectly together in a tart. Your presentation is just beautiful!